Found below are the patch notes for this week. 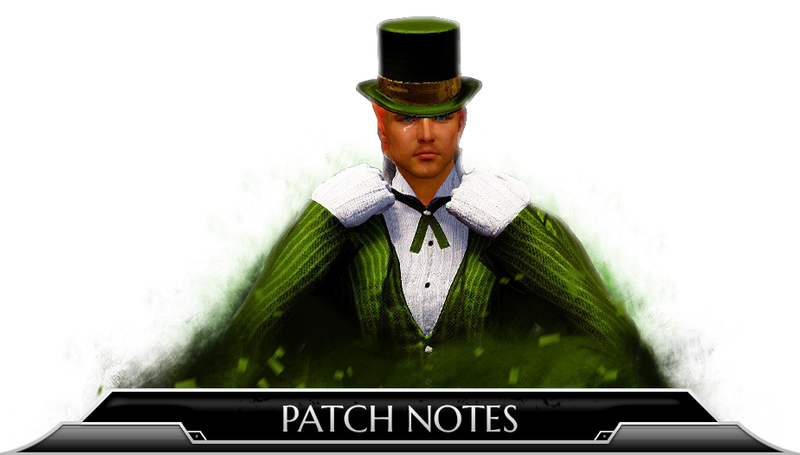 This week the Black Spirit’s Adventure has returned, we have added several Dark Knight costumes, and of course, we celebrate Saint Patrick's Day. The patch this week is ~400 MB. Black Spirit’s Adventure has returned! Roll the dice a maximum of 3 times per day for a chance to receive prizes. St. Patrick’s Day Mini Event begins! To celebrate St. Patrick’s Day, all players will receive beer on 3/17. Please check your in-game mail on this date to find your delivery of beer! * The event rewards will be obtainable from your mail until 3/31 after which the unclaimed mails will be deleted. Additional St. Patrick’s Day Celebrations! A limit of a maximum of three purchases per family name of the Green Dye Box Bundle for 1 Loyalty point. The following 7 outfits become available in game. * The above outfits can be transformed by using ‘Equipment Tailoring Coupons’ to give it an amity of +15% (* Since the basic effect of ‘Calpheon Noble Dress’ is Amity 15%, This item will get additional effect of Movement Speed +2) . After the transformation, the costume can be equipped in the same slot as a pearl costume but can’t be registered to the marketplace. These outfits can be crafted after purchasing the design blueprint from Merv (NPC) in the Capital of Calpheon. Get the design blueprint from Yaz (NPC) located on the 2nd floor of Valley Lily Inn in Heidel in order to craft Orwen Travel Clothes. Get the ‘Craft Permit: Golden Armor with Patterns’ and ‘Craft Permit: Finest Female Casual Clothes - Women’ from Carolin (NPC) first then purchase the design blueprints from Ornella (NPC) in order to be able to craft Jarette’s Armor. Get the ‘Delphe Knights Certificate of Contribution’ as a quest reward from Jeron (NPC) at Delphe Knights Castle and exchange it with Granbill (NPC) for the design blueprint to craft the Delphe Knights Outfit. The design blueprint can be obtained from Ornella (NPC) in Heidel by purchasing it from the amity shop. Old Casual (Female), which is needed in order to craft Thermian Casual, can be obtained by Drying; processing menu (L key) Washed-Up Laundry that can be obtained from fishing. Guild War Declaration Rule Changes. Guilds who do not possess a node or a region CAN declare a guild war on any guild. When exchanging Black Spirit Soul Water X10 for a Magic Crystal of the Sun - Assault, you will now receive the correct item. Players will no longer collide with destroyed Hwachas. Margoria Screenshot Event Winners screenshots have been removed from the game due to the event period ending. In the Quest UI, text displaying region names that have yet to be discovered have been fixed. Fixed the issue where auto pathing would be interrupted if a Guild Ping is set on the map. 25minutes before server up, can we get black stones as compensation please? Woah, patch notes before server going up?! Progress. Because the tailoring coupon isn't insulting enough, we're now going to mention it in every patch note that has a craftable costume in it, just to throw it in your face. Thanks though! Got in an early response for once. Did you post this by mistake? No, because for once you did your job properly, you should get some candy for that. i love that valk outfit. But the questions is: blue accesory items for my epheria-sailboat when? I am back and this is the first thing I see, this is nice. What's this.. Patch notes.. A HEAD OF LAUNCH?! I'm confuzzled, but also slightly satisfied! have they fixed the Disconnect issue yet? 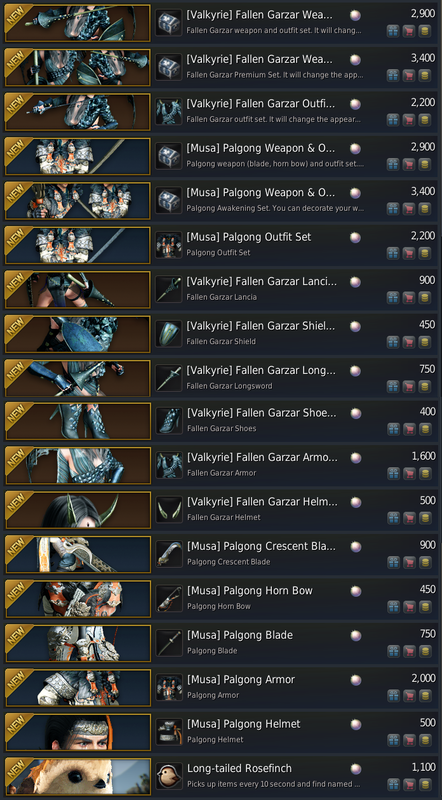 When are we going to get a nice influx of outfits that have been out on Korea for quite some time now? I've been waiting for a few Sorceress outfits for quite some time now such as Key Sleeve and it's just mind bottling how we still haven't received these yet.